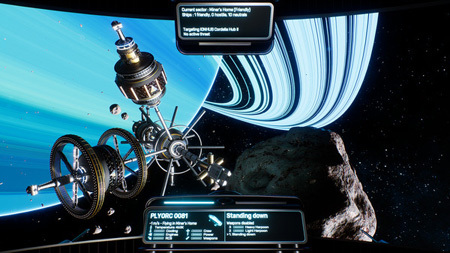 Helium Rain is a single-player space simulation from Deimos Games. It places you at the helm of a spacefaring company. Trade resources, buy ships and stations to fulfill contracts. Dock at stations to buy and sell you wares or upgrade your ship, upgrade your technology to be more efficient and militarize your fleet to prevent piracy. Trade your wares and eliminate the competition in a cutthroat world. Buy new ships and stations to mine and haul resources. Explore the vast emptiness of space. Explore around 25 sectors orbiting the gas giant Nema and its moons. If you get stuck in the game, check out the video walkthrough and gameplay for the game. This entry was posted in PC Games, Walkthrough and tagged Helium Rain Cheats, Helium Rain Game, Helium Rain Gameplay, Helium Rain Guide, Helium Rain Hints, Helium Rain Review, Helium Rain Solutions, Helium Rain Strategy, Helium Rain Tips, Helium Rain Walkthrough by Marvin. Bookmark the permalink.